This is the first quarter status report on my dry year. Believe it or not, three months have come and gone since I quit drinking as my New Year’s resolution, and started this blog to share my thoughts about that and other things. To be perfectly honest, I’m completely over the whole not drinking thing. By that, I don’t mean that I want to start drinking again. What I mean is that not drinking alcohol has become so ingrained in me that I just don’t think about it very much. And that’s making it difficult to find things to write about. At the end of my first month, I reported that I had lost six pounds simply by not drinking, and that I was dismayed that forming a new habit was going to take a lot longer than I had expected. Then, at the end of my second month, I realized that my old habit of drinking wine every night had disappeared unnoticed, and I was 11 pounds lighter. In between those two posts, I revealed that a big motivator for embarking on my “dry year” was my belief that alcohol was preventing me from losing the 20+ pounds I had gained over the past several years, as well as from being a more competitive runner. In chunking out my planning and goals into more manageable bits, I decided not to change anything else about my eating or fitness routine in January. And, in February and March, to focus on my diet first, mainly by using MyFitnessPal to track everything I eat, as well as my exercise. I hoped to lose 15 of my goal of 20 pounds by that time. My plan was to then pivot from my diet to my running and race training in April, and to try for my personal best marathon time on my 46th birthday in late July. Assuming all goes accordingly, I would still have five months to complete my diet goal before the end of the year. Even though there’s still snow on the ground here in Vermont, March is over. The inevitable question is: How am I doing? Drum roll please….. I lost 15 pounds! I’m particularly proud of that, because I was on vacation the first two weeks of March. In just 90 days, my Body Mass Index dropped from 24.7 to 22.4. According to the U.S. Navy body fat calculator, my percentage of body fat dropped from 27% in mid-February to 24% today. I’m not quite in the “fit” category yet, so there’s more work to do. However, I’m really getting close to my ideal weight and fitness level, and feel very happy with my results. So far, my theory that losing weight will make me run faster appears to be correct. I took part in the Run for the Border Half Marathon on the New Hampshire coast this past Sunday. It was raining, windy and cold – I got hit by foam and sea water from waves that crashed against the seawall and sprayed onto the race route! 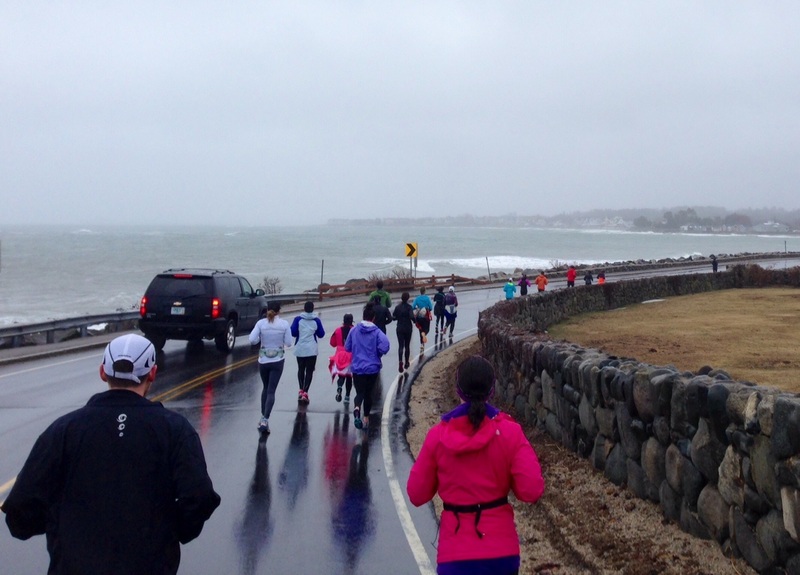 Because of the crazy weather and coastal flood warnings, the race was shortened to 10.19 miles. I surprised myself by racing at a 9:02 per-mile pace, much faster than expected. Last year’s half marathon results were all slower than this, ranging from a 10:27 per-mile pace in Middlebury in May, to a 9:20 pace down in Manchester, Vermont, in early September. I felt very comfortable the whole race and definitely had more in the tank when I crossed the finish line. Over the past three months, the most important thing is that I had decided to reward myself early with a trip to Laos. Since I was saving well over $4,000 this year by not drinking, and it was burning a hole in my pocket, I deserved a big reward for all of my efforts. My 10-day trip was unforgettable and under budget — around $2,500. Later this year, when I reach all of the other goals I’ve outlined, maybe Bruce and I will take another trip together to celebrate.